On March 28, joining hands with China Telecom Ltd., Nokia launched Lumia 800C — its first Windows phone in China. Before its debut in China, Lumia was first released in London at the end of last October. The United States, Singapore, Hong Kong and other countries and areas have also witnessed its release. The conference for its debut was held in Beijing Yongding Gate- a historic relic and landmark architecture. With a history from the Ming Dynasty, Yongding Gate was once destroyed but was rebuilt in 2004. The reason why they chose such a place for the launch of Lumia, said Nokia CEO Stephen Elop, was that the reconstruction of Yongding Gate symbolized the revival of Nokia itself. In front of Yongding Gate, Elop was interviewed by China’s press. Editor’s note: This interview was translated from ZDNet China’s account. 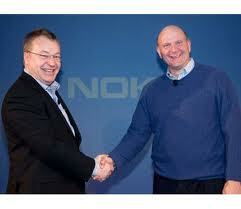 Elop: Our cooperation with China Telecom started when Nokia was planning to promote Windows Phone. China Telecom and its Chairman Wang Xiaochu have been supporting us all along. Since China’s three operators are all great and famous, we would like to cooperate with each of them. It’s only a matter of time. Nokia has to make some special modifications to satisfy the requirements of Telecom and CDMA phones. Q: This week Tim Cook- Apple CEO visited China, too. And it seems that mobile phone makers are paying increasing attention to the Chinese market. How do you evaluate the changes happening in China’s smartphone market? Elop: We not only frequently send our international high-level delegates to China for visits, but also have set up many local research centers and manufacturers in China, which means Nokia is well aware of China’s situation and is developing its business accordingly. We are striving for success in the Chinese market by catering to Chinese consumers’ constantly changing needs. Of course, like markets in other countries and areas, China’s market has been in a state of flux. In such a dynamic and competitive market, lower-priced mobile phones have flooded into the market. Nokia will frequently release new products to meet the demands of the market. In addition, we will create innovation for China based on the unique tastes and needs of Chinese consumers. Elop: I’m not sure how many people are using Lumia in China. Since Nokia hasn’t started selling Lumia smartphones in China’s market, I guess most of its users bought it from Hong Kong or Singapore. I believe Lumia will embrace more users after its official release in China. As China is a large market for us, surely we would like to see Lumia boom in China. Anyway, it takes time for consumers to get to know our new products, to acquaint themselves with their user interfaces, to accept the new smartphone ecosystem. These all take time and effort. We have accomplished our first step by bringing new products into China. After this, there will be advertising and promotion, and the feedbacks from the users. By that time we will know how Lumia has been performing in the market. Anyway, we are looking forward to a wonderful performance of Lumia in China. Q: Last February, Nokia announced its new strategy. Now over a year has passed, what phase do you think is Nokia in? Are there great opportunities and challenges facing Nokia now? Elop: With the new strategy, there are various phases in the transformation. At first we only had a blueprint of the strategy without actual products to implement the strategy. Then we released the first line of products and promoted them in each market. Now we are trying to find out how consumers feel about them and are improving the products all the way. After this phase, more and more of our products will be introduced to the market, each with new features and functions. Besides, more companies will be our partners, to help with our research and development of new products and make them stand out. This is the way Nokia is expected to go. I’m glad and encouraged to hear users making positive comments on our products. They generally think Nokia products practical and useful. In such a competitive market where iOS and Android ecosystems are dominant, we are going to redouble our efforts to battle with them. We call for constant innovation, which is the key to Nokia’s success and enables us to solve the problems facing Nokia users. Q: You mentioned earlier that Nokia hoped to convert 200 million Symbian users to Windows Phones. How are you going to do about it? Elop: In the transition to Windows Phones, we need to make sure our Windows Phone system and mobile phones will attract consumers with good services. Besides, we will install relevant programs on the Windows Phone platform, ensuring a smooth transition from Symbian to it. Q: In China, low-end mobile phones will be challenged by national brands such as Xiaomi, Huawei and Lenovo. How will Nokia tackle the challenge? Elop: Actually, one of our new strategies include a whole series of smartphones including high-end ones and low-end ones. So we are trying to expand our portfolio and product choices. Q: Would you like to comment on your management style? Elop: I think it is important to keep your mind and eyes open. In the mean time, you need to be frank with your employees and communicate with them straightforward. As far as I’m concerned, I talk with my employees openly and honestly on many occasions, and I would spend a lot of time discussing with them the challenges. I believe such open communication can bring our business into a fast-developing track. Nashua Firm Acquired by Blackberry Mfg. We request you to provide maximum information related to your travel plan in the "Requirements" field This will help us to process your information quickly and accurately.